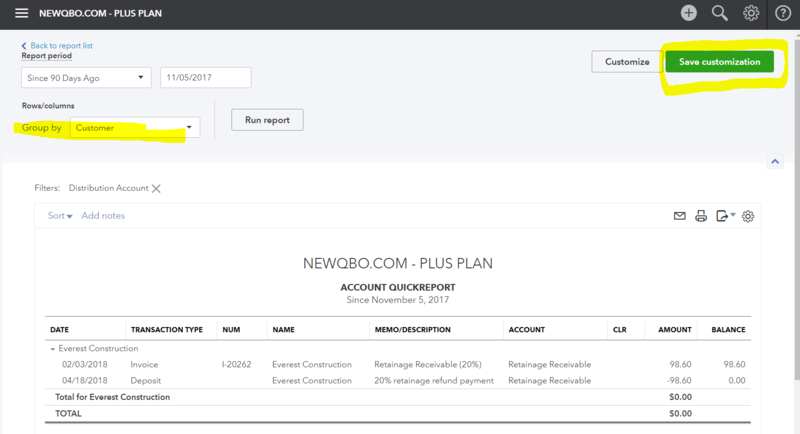 How to handle customer retainage retention in QuickBooks Online? Example: A customer we do work for keeps 20% of our invoiced amount until we reach a certain amount. That money is ours. They just hold it back in an account for us in case something goes wrong on a job that is our fault. How do I record that in QBO? DEFINITION: Retainage is a portion of the agreed-upon contract price deliberately withheld until the work is substantially complete to assure that contractor or subcontractor will satisfy its obligations and complete a construction project. Let’s get started with step-by-step instructions for you. From the left Dashboard panel, click Accounting. In the Chart of Accounts, click “New” green button at the far top right corner. For Category Type, select Other Current Assets. For Detail Type, select Retainage (at the near bottom). For the Name, enter Retainage Receivable. For the description, enter Retainage Receivable (same as Name). Click the gear in the top-right corner of the screen. From the drop-down menu, within the Lists section, select Products and Services. In the Products and Services window, click “New” green button at the far top right corner. Enter a Name for the item (i.e. Retainage). Optional: SKU and Category fields. Under Sales Information, place a check-mark next to I sell this product/service to my customers and enter “Retainage Receivable” (this is for the description on sales forms i.e. Invoice). 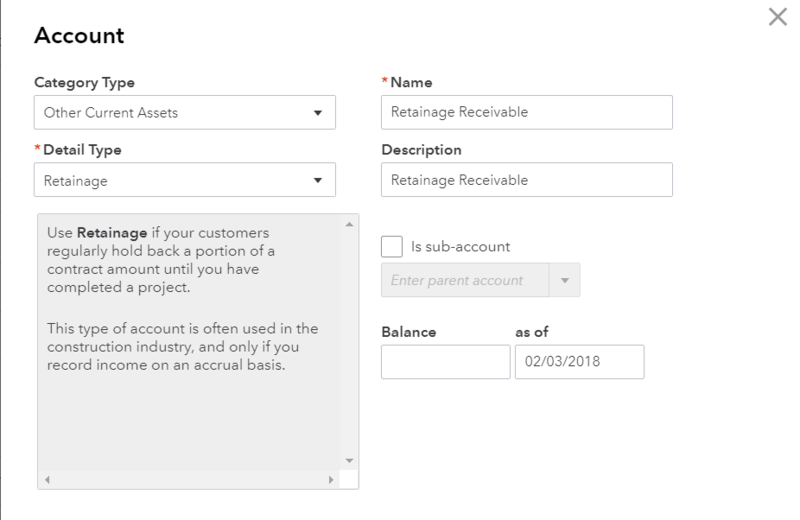 Select the Retainage Receivable account (you just created) from the Income Account drop-down. Be sure to Uncheck “Is taxable” box. 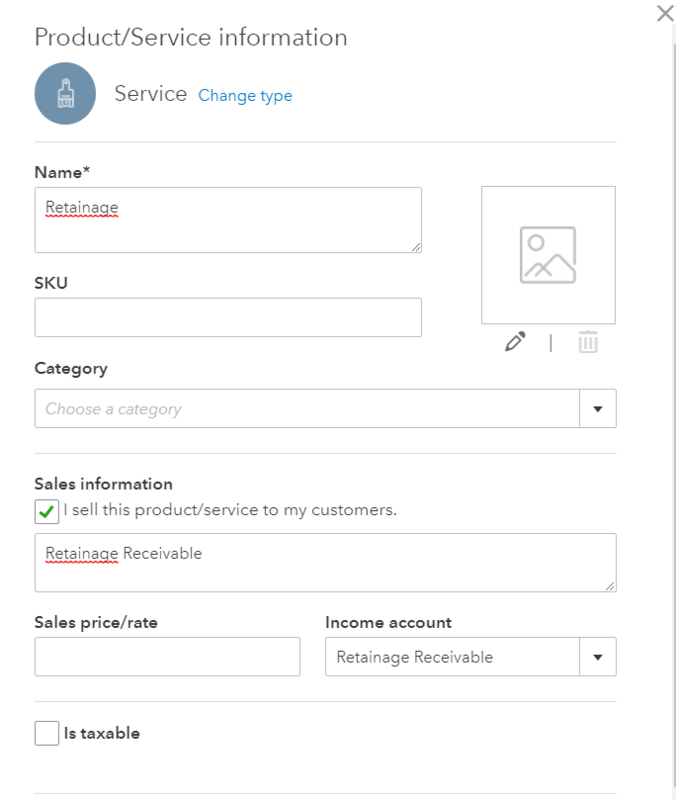 How do I record retainage or retention in QBO continue… Next step is create an invoice/sales recipt with retainage withold line item. Click the + plus symbol, located at the top of the screen. Select Invoice under Customers heading. Fill out the remaining fields of the invoice, including the product/service line items. Optional: if you’ve multiple line items, click “Add subtotal” (below Product/Service column). On the next available line of the invoice, select “Retainage” from the Product/Service column. In the Rate or Amount column, enter the amount of the retainage as a negative (-) number. (In this sample Invoice below, the subtotal line amount is $493.00 and 20% is retainage rate. So, either on rate or amount column, just enter 493*-.20 and tab it. You will get negative $98.60 or just compute the amount and enter it). Select Bank Deposit under Others heading. And enter the rest as you need. In the Chart of Accounts, locate “Retainage Receivable” account line. Go to “View register” under Action column at the far right corner. From the drop-down arrow, select the “Run Report” button. Under Row/Columns at the top left, change “Group by” to Customer (especially if you have multiple customers with retainage balances). This report will give account details by customer balances. Since you will need to track these retainage activities regularly, click “Save customization” green button, located in the top-left corner of the report window and name it “Retainage” report and Save. Now, you have saved this report for future use. Next time, when you want to run this report (Dashboard > Reports > Custom Reports tab > locate Retainage report and run the report). See screenshots below for reference. For “How to handle vendor subcontractor retainage retention in QuickBooks Online” click HERE. If you have questions regarding this article or any other QuickBooks issues, please CLICK HERE to ask a question.